I’m just into the last few days of my 30 day detox. I’ve done it before, so easy for me and I know what to eat, but for those tackling it for the first time it can be overwhelming at first. Some of us are told that we don’t need to do detoxifying and stuff as the body takes care of itself. IF that were true, we wouldn’t be walking around with all these mysterious symptoms that the doctors can’t explain. I’m a nutritionist, I should always be healthy, I don’t need a detox, right? Well, I’ve got my own set of stressors (physical/emotional), just like you. I eat clean. I don’t drink coffee or have a lot of sugar, so I never get tired or sick. But I also have mental stressors, treat myself to certain foods from time to time and enjoy the odd glass of wine. So I do cleanses or intermittent fasting to restore gut balance and support my body’s functions. Gut Balance – we’re hearing more about it these days, yet most of us go about our daily lives never thinking twice about it. You probably think your gut is healthy, but I bet it’s not! For example…do any of you suffer from gas/bloating, constipation or diarrhea? 70% of your body's seratonin (the happy chemical), is made in your gut. If your gut's out of whack, your focus and mood may be affected, leading to anxiety or even depression. Plus, the bacteria living in your gut make up 3/4 of your body's immune system. Most of us have too many of the bad guys and not enough of the good guys. 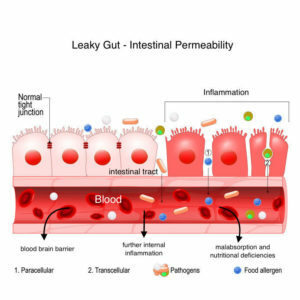 The imbalance of gut microbes (micro biome, flora, etc..) leads to something called leaky gut (dybiosis is another term). This allows the bad bacteria and other things to infiltrate our bodies as the diagram shows. This can lead to some obvious symptoms such as fungal infections, bladder infections, heartburn, IBS, bloating and gas. Other symptoms that you would never attribute to this could be skin, bowel, joint or mood issues; such as, arthritis, eczema, brain fog, IBD, Autism, Chronic Fatigue, ADHD, fibromyalgia and others. There are still some people who think this is all nonsense, but there are now thousands of science based papers proving this concept! Here’s just one of them, if you’re so inclined. If you’re ready to invest in your health, you know where to find me! "Oakville Awards For Business Excellence Finalist"